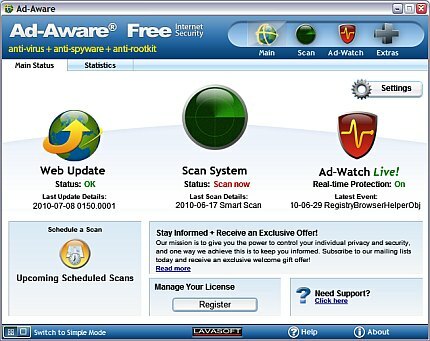 Adaware Free was just released on July 6, 2010 and happens to be the biggest improvement to the software in at least five years. Now Adaware Free 8.3 includes antivirus protection capabilities and even a real-time shield. We previously reviewed Adaware 8.1, in October 2009 and at this time only the paid versions had antivirus protection. Today Adaware Free is now officially a full free Internet Security Software and remains the 1 of the 3 free editions out there. Real Time Engine â€“ Adaware Free 8.3 includes always on protection against viruses, spyware, rootkits and any malicious software. In fact, the real time protection now includes a proprietary technology called Genotype Detection. Genotype is a new heuristic detection system that can find and detect malicious file modification and/or activity. Automatic Updates and Scheduled Scans – The bullet point says it all except the Automatic Updates are pulse updates. This means that they donâ€™t arrive once an hour like Free AVG limits updates, rather they arrive as frequently as necessary. Pulse updates are only available in paid antivirus prior to this release. Adaware Free 8.3 can also schedule scans which is also considered a premium feature. Download Shield and Privacy Sweeper â€“ When a user downloads a file from the internet Adaware free scans the file before the file is even completely downloaded this is similar to eScanâ€™s scanning technology. Adaware free 8.3 also has a built in privacy sweeper that eliminates download and cookie tracks. The download package is quite large at 120 megabytes and the resource usage is kind of high. I would recommend running adaware free with at least a dual core processor. Next, the real-time shield only includes process detection and not more advanced protection offered in the full versions. Finally, the interface is kind of clunky and still needs a larger revamp. However, Adaware is now the most comprehensive internet security solution available. One needs to at least test the software on their computer.